Step to Success: A step to your success is anything that moves your life and your business forward. Whether it’s an app, a book or an idea, you can apply something today that can help you succeed. Today’s step to success is on sharing your goals and dreams, and I recommend that you set criteria on who you share with, where you share and what you share. Dancer’s Dialect: The Dancer’s Dialect is the dancer’s language. I share dance terminology and concepts across different genres so you can see the correlations in your life and in your business. The word for today is gaillard, which I share to stress the importance of simplicity and complexity to enhance dance training and learning. Freestyle Flow: My son is all about Pokemon and Minecraft and since he collects Pokemon cards, he asked what I would like to collect. I told him I like to collect experiences. Myth 1: You have to wait for inspiration to strike to have a great mindset. Myth 2: Your personality determines your mindset. Myth 3: Your circumstances controls your mindset. Stop waiting for the perfect conditions. Start somewhere. Myth 4: You need to become like Pollyanna and ignore things hoping they will go away on their own. Myth 5: You need external affirmation to accelerate. Not everyone is going to approve of you or understand what you’re doing, and you need to be okay with that. You cannot please everyone, nor should you want to. Myth 6: You have to adopt a popular mindset. If everyone is doing it, must be good? Not always the case. 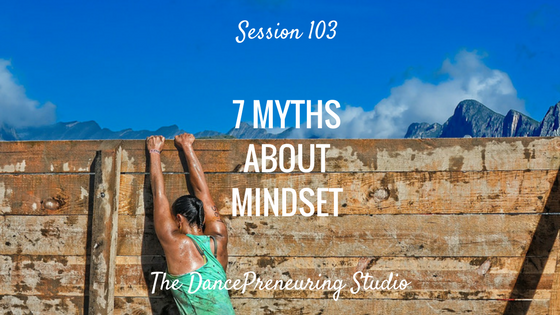 Myth 7: If you have a setback or a plateau, you failed and you don’t have the proper mindset. Question: What myth can you dispel about mindset?